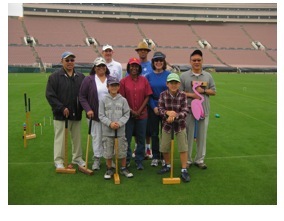 With the generous support of Rose Ann and Jess Waiters, Croquet in the Rose Bowl will take place the afternoon of Saturday March 24th. Opening in October of 1922, this grand stadium became the home of the first Rose Bowl Game in 1923 and has been the site of the annual college football Rose Bowl on New Year’s Day. 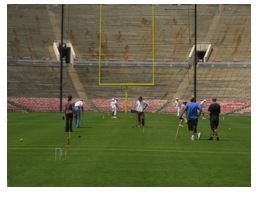 In 1982, it became the home field of the UCLA Bruins college football team of the Pac-12 Conference. The natural grass playing field runs in a north–south configuration and sits in Arroyo Seco, a dry riverbed just to the northwest of the center of town. 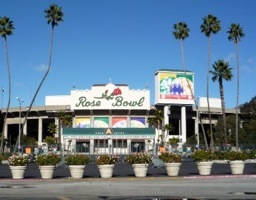 The Rose Bowl is a National Historic Landmark and a California Historic Civil Engineering Landmark. Its design was based upon the Yale Bowl in New Haven, Connecticut. Get ready to play a 9 wicket game of Cut Throat- no partners, one ball per player. The flat courts and smooth playing surface will permit the full standard USCA 9w court, 100 feet long and 50 feet wide. With the wickets set at 4 inches wide and deadness carryover, this is the game that made the West Wild! All equipment will be provided, but bring your own mallet if you have one. Don’t worry. If you don’t know how to play croquet, we’ll show you. If you already know, come out and play whatever type of croquet you’d like. We’ll have plenty of courts available. There will be several courts for 9 Wicket, 6 Wicket and Golf Croquet. 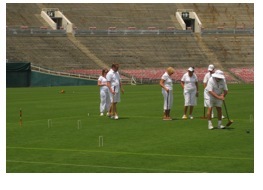 If you are unfamiliar with the 6 wicket or Golf croquet versions of the game don’t worry. PCC members will be there to help you. Events will be staged in hourly increments. People can play during the 1:00 pm and 2:00 pm hour slots. We will come out to the gate 5 minutes before those hours, wait five minutes, and take the collective group into the Rose Bowl. You will have one hour. That will be more than enough time to learn how to hit the balls, play a game, and take all the photos you want. When the hour is up, the entire group will be escorted out of the Rose Bowl together. This is one of the premier stadiums in the United States if not the world. Even for college football players, few get to play on this historic turf. If you watched the Rose Bowl game on TV, followed your team up and down the field, now’s the chance to walk across the 50 yard line yourself. This event is free, although donations will be gratefully accepted. If you have questions or would like to enter, please click on the Contact Tab at the top of this page, and select Michael Rumbin. See you at the Rose Bowl!